As such no significant structures are remaining on the fort, except good scenery and few water cisterns. An important part of this thrilling trek is the cave, which is situated on the other side of fort, and the way goes through dense vegetation. Walking for few minutes� leads to a diversion and the way to right directs to a cliff called the cliff of "Kalakrai�. The narrow ridge between the cliff and the mountain descends to a narrow straight path where we come across two caves. One should proceed from here by taking support of the rocks and should be quite careful. Ascending the rock patch where a bamboo and a rope are used to climb to the caves. The caves as such are sacred as the Lord of Bahiri resides here. From the caves, we can have a glance of the terrifying beauty of peaks of Sahyadri. We can also see the beautiful twins forts of Rajmachi, Shrivardhan and Manranjan. Here one can use the cooking vessels kept in the water in the cave. They should be kept back by cleaning after using them. A legend says that one who tries to steals the vessels, perishes. 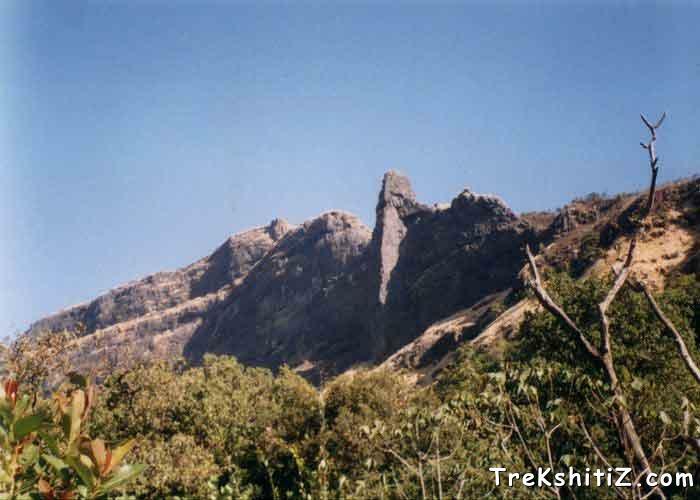 This pinnacle is quite famous and frequently visited by mountaineers. The way to the left of the ridge takes to the cliff, but a rope and rock climbing equipment is necessary. Moreover, people can also enjoy an existing campfire in the forest below. Choosing a place on the outskirts of the forest with less vegetation, one can stay here for a night and experience an exciting campfire. Here we can enjoy sky observation, as the sky is clear. From Karjat one should aboard the S.T. bus for the village of Wadhap. We have to cross a rivulet, and a way leads straight to the fort. There is a temple on the fort. To the left of the temple is the way, which leads us to the ridge between the fort and the pinnacle. From Karjat, S.T. buses ply regularly to Sandshi. Its better to board the bus in the early morning as the midday sun heats the rocks. From here, a guide is required, as the way proceeds through dense vegetation and is quite confusing. After a walk of 2 hours we reach the ridge between the pinnacle on the left and the mountain of Dhak on the right. Way through the ridge leads to the cave of Bahiri. There are rock-hewn steps, and following them is a rope, bound to a bamboo. Here we have to climb safely. Above the cave is the wall of mountain on which the fort of Dhak is situated. While going to Rajmachi from Lonavala, we come across three prominent waterfalls. After we pass all waterfalls and cross the stream, we come to a distinct diversion. The way to the left goes to Rajmachi, and to right is Dhak. It takes 3-4 hours to reach the fort from here, via Wadhap. One can stay on the fort in the cave of Bahiri.Campfire can also be planned in the forest below. One should make arrangements for foodstuffs. The cooking vessels are available in the cave of Bahiri. 1) Water cisterns near the caves. 2) Small water ponds in forest.